Oh how I love Love Get Crafty (I had to say that)… I wasn’t sure what to call this month’s Get Crafty, but there is no other word than “Love”. Yes, there is lots of pink and red, but there are truly fabulously lovely crafts.. not surprisingly there is also a fair range of “Get Crafty Oooh” – i.e. the kitchen crafts! Well, no way better than to show your love than through food! Certainly in our house and I know I will be taking inspiration myself! Sooo. Sit back and enjoy LOVE GET CRAFY! Been featured? Why not grab a Featured Badge? Like to be featured in the future? Email me on info (ta) redtedart (dot) com with “Get Crafty” and the theme in the subject line! If you do find yourself being inspired by Get Crafty, I would love for you to link back to Get Crafty, as well as the original crafters!!!! We would all love to see what you have been getting up to. What I love, is when Valentine’s day is not “just” about partners, but about the whole family and your friends. 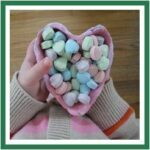 I love these heart finger puppets – they are easy to make with kids and OH SO CUTE! Visit Katie Did and check them out! 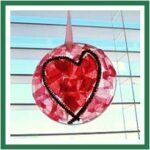 These are not just adorable little sun catchers, but they are perfect xmas recycling in time for valentines. They are simple and yet so effective. 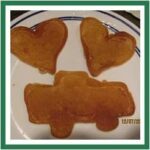 Liz at Me and My Shadow made these with her little girl. Go take a peak now! 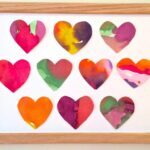 I know that many of us have seen the wonderful “recycled” crayon idea already… but ADORE the fact that these are made in heart shapes – they look cute, colour fun and fun… and, it is probably easier to use them – as the bottom of the heart is a great little point to draw with. This time visit Creative Mommas for more. I love that they give extra tips – I have heard of plenty crayon melting exercises going wrong! And I love that she encourages her kids to give these to her classmates. Lovely. 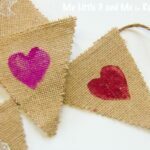 I love this Guest Post on Red Ted Art, where Kelly gets crafty with her toddler and makes a number of lovely Valentines cards… I particularly like it, that she takes the opportunity to practice sewing. 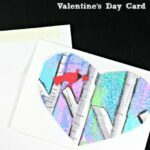 Check out how to make a valentines card with your toddler. These little heart bowls are simply too cute. 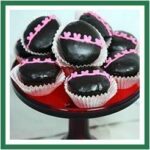 Their simplicity is what makes them adorable and filled with sweets will make anyone very loved. The children at La Famille get stuck in with clay and have lots of fun. Liz at Me and My Shadow is obviously a romantic at heart – not only did she create the pretty sun catchers above, but she also came up with these wonderfully gittery valentines cards. I believe she is still finding bits of glitter in her kitchen. If glitter is too scary for you, she has more card ideas, so go on, hope over and visit Me and My Shadow now. I love Michelle and her blog This and That about Kids. 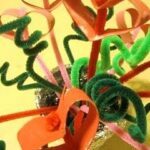 She is a fellow loo roll crafter enthusiast and always comes up with fun kid friendly ideas… such as this Pipe Cleaner & Loo Roll Heart Bouquet. Simplicity and cuteness at its best! 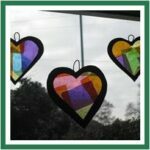 Suncatchers really are the best for little hearts and imaginations. Here we have another pretty little Love Sun Catcher. I love the re-use of container lids for these ones, making it easier for small hands! 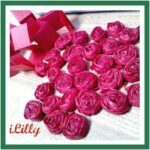 Visit Elle Belle’s Bows and see how they got on! This Wax Crayon garland is ADORABLE! 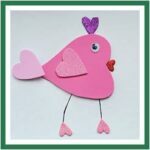 There are a number of fab v day crafts here, you must come and look and all are made from things around the home. 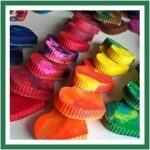 I have highlighted my favourite though: hearts made out of crayon shavings… FABULOUS! So so so cute.Go visit My Mommy Makes to see how, as well as some other ideas too! I love it when the little babies are not forgotten… and I love it even more when older siblings are involved in making something for them. I think it is a fabulous idea to make these mobiles using friendly faces – a great way to also introduce friends and family that live far away. Cathy from Nurturestore shows us how. Meet the Dubiens made this adorable little bird all out hearts. How cute. We love crafting out of “basic” shapes, it really makes you use your imagination! 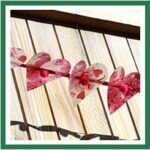 I love the bit of crafty recycling that is going on to make these GORGEOUS looking hearts! You don’t need expensive materials to have fun with your kids and this proves it. Old print paper and magazines are converted by Sun Hats & Wellie Boots. Go an be inspired! 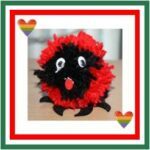 Ooooh, who doesn’t love a pom pom creature, especially when it turnsi nto this cute Love Bug? 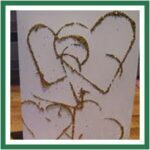 Though I love hearts, it is also nice to see “other shapes” for Love Get Crafty and this is a perfect little guy. Cass at Frugal Family gets crafty, hop over for more info! I wholeheartedly agree that roses at “this time of year” are ridiculously expensive and then they die anyway… so these are a fabulous alternative to cheering up anyone’s house – whilst showing them that you love them. Afterall, you went to all that trouble to make something for them!! Certainly would be lovely throughout the year too! Chris and Thinly Spread shows us how. 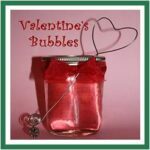 Let your loved one relax in a romantic lovely bubble bath – you will find both the bubble bath recipe and how to make the cute heart shaped bubble blowing wand! Head over to “From Glitter to Gumdrops” and find out more! 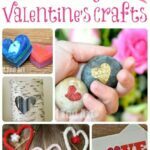 Cute and romantic marble magnets – these will get the dinner party conversation going at any rate – a great opportunity to make them for Valentine’s day, but they will look lovely all year round. 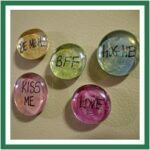 Visit the fabulous Crafts by Amanda for how to make these and many many other ideas! 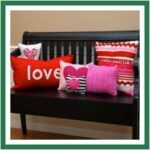 Very cute cushions to brighten up any room and show your love. I love how some of these are made from recycled materials (e.g old sweaters). Visit Felt So Cute for all the different ideas. 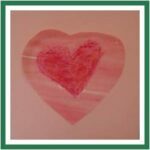 Easy Valentines Art, easily personalised, all you need is some transparent print paper… it is a great craft for those of you who may be more reluctant! Check out Trendy Pockets for more! More word art. Wonderfully crafty – check out how somewhere in craftland made this word art! I love the finished effect. Very stylish and of course lovely! 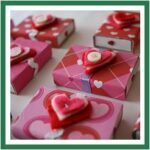 Need a little box to tuck a love note? or a small gift? 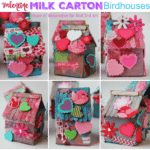 Make these oh so cute little Love Matchboxes. They are so pretty and yet so simple. Truly crafty! Life in The Thrifty Lane, tells us more! 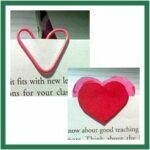 …or why not surprise someone you love by adding a little heart book mark into the book they are reading…? Sneak it in and the next time they open the page, they will have a lovely surprise. They are both simple – the first only requires a paper clip. Easy peasy. Time to visit Living Life Crafty! 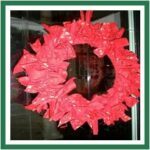 If you love wreathes you will love this wreath – it is recycled, it is crafty and it is all about love. Very pretty. Visit the lovely creative Karen over at Sippy Cup Central! Now how is this for an original idea? Why send a heart, when you can send a Kiss on a Stick? Or why not have a Kiss on a Stick party. A cheeky cute entry from Greenbean’s Crafterole. And if you like it, you will find all sorts of other things on a stick.. This is a lovely little recycled garland… and you know what the best thing about it is? It needs NO SEWING! No. Not one stitch. How is it done, I hear you explain. Well, you will have to visit two shades of pink and read more! Ever wondered how to make those cute little rosettes, well, they are easier than you think! 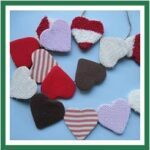 AliLilly whips up a number in no time and puts them together into a lovely heart wreath. Now the post over at Wray Sist3rs shows us how to make a great little frame with old book pages… But what I really love, is the cute cute cute photo she will be putting it.. I can’t wait to take a photo like this!! 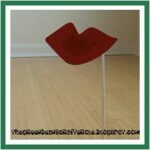 Embroider Hoop Art for Valentines! Plastic Cup “Sweetheart Light Decor” idea! Check out these Printable Valentines from Skip to My Lou too! And these EOS Monster Valentines are so fun! Well we all know that love goes through the stomach… and this lovely selection of yummies is proof! 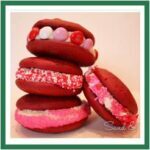 Well… our very own Love Heart Cookies as Guest Posted by the lovely Sarah at Maison Cupcake. These are delicious and you can make them with or without the kids. You can even freeze the dough! How yummy and lovely! 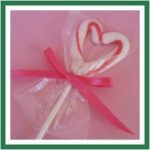 I LOVE these little candy cane hearts – they are so so cute and so easy to make and great way to use up some of that candy cane left over from Christmas. Perfect all around. The lovely ladies of Skip to my Lou do their magic! My son loves pretzels and this pretzel he would love. Little Wonders’ Day made these a couple of weeks back – without the big V-Day in mind – but you know, I think that that is perfect. I love it when you make lovely things and it isn’t driven by a day in the calendar. Hooray! Oooh, these look mouth wateringly pink and simply delicious. Don’t you just want to take a bite? Visit Sand & Sisal for instructions and recipes! I adore cheesecake and so does The Englishman. This cheesecake was baked for Christmas, but I don’t see why a Valentine’s Day isn’t as good? It oozes luxury and romance. Mrs Happy Homemaker shares her recipe! If going on a big baking expedition is a little too much for you, then come back down to the simple things in life: Pancakes. Simple. Yet good. Cut them into hearts and you have a lovely romantic breakfast (or dessert!). Live, Learn, Love got crafty. And then back to the divine. Fudge Ripple shares are little heart decor ding dongs with us. I want some. Now. These are lovely indeed. I first saw these in time or Christmas by Cathy and her girls at Nurturestore – they look tricky, but they are lots of fun. Thank-you so much for featuring our lovebird Maggy! I can’t wait to check out all the other fabulous crafts. Ooops Michelle – will go and see if I can fix it! 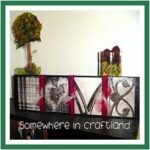 Jill – my pleasure, it is your contributions that “make” Get Crafty! 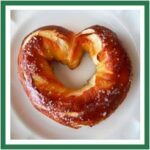 Maggy, thanks for featuring our pretzels. They were fun and delicious to make! 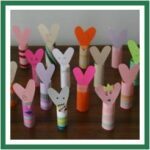 You have a wonder line up of valentine’s crafts here. 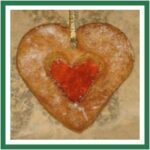 Little Wonders’ Days – Well… as mentioned we love pretzels and love that this one turned out heart shaped! Amanda- love your magnets! And thanks for grabbing a button! Thanks again for your lovely ideas! thanks so much for including my project in your post! Hello Sweet Maggy! Thank you so much for featuring my heart garland. I would be proud to grab a button. 🙂 You have featured so many lovely crafts and goodies. Love them all! Wow! Everything looks so fun. My kids will love some of the kid projects. Thank you so much for featuring my “love” letters. My kids helped me look around the house to find them and they had a BLAST! Thanks for the post feature from our blog. 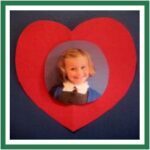 Chelsea will be so thrilled that you featured her heart shaped crayons! 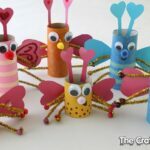 They are such a fun craft for kids & a great gift 🙂 What a great list of crafts you have here with such fun ideas!! 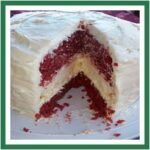 What a great list of ideas for Valentines Day — something for everyone! Thanks for compiling it this great link-round-up! thanks for the shout-out….all of these ideas are fantastic. thank you for sharing your great finds. 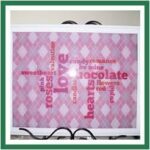 Thanks so much for featuring my valentine frame and photo idea! That was a fun surprise. Every thing on your list looks great! I can’t wait to check it all out! I love all of them. 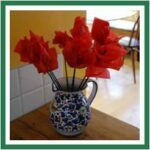 Valentine’s just look wonderful in all different mediums. 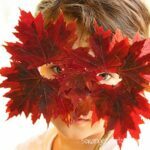 There is a weekly Kids Get Crafty (with or for kids!) starting every Wednesday until Monday – this is na unthemed free for all link up! And then there is a monthly THEMED Get Crafty – with submissions via email (info (at) redtedart (dot) com). Submissions usually by around the 25th/ 27th of the month – though I do get “full” before then. I always post the new Themed Get Crafty on the 1st of the month. Coming theme is Spring. 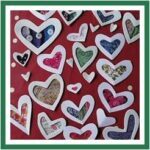 Thank you so much for featuring our recycled hearts. Such fab ideas, I can’t wait to try some out. Such cute Valentine’s ideas for everyone. Thanks! Thanks for sharing all of these great ideas. Have a great weekend!